When an email landed in my inbox, inviting me to help organise a bloggers event which would involve swinging from trees like Tarzan and shooting bows like Merida in the middle of Devon countryside, of course I jumped at the chance! Once the epicentre of the global copper industry (now part of Cornwall and West Devon Mining Landscape World Heritage Site), Tamar Trails Centre is located in the Tamar Valley Area of Outstanding Natural Beauty. Just a short drive outside Plymouth, not too far away from Tavistock/ Gunnislake area, this exciting hotspot of adventure is tucked away in the most glorious countryside. Tamar Trails Centre is home to the Beech Tree cafe, an interpretation area with live wildlife webcams, a meeting room and a tonne of exciting outdoor activities!. There is also 25km of trails for walkers, cyclists and horse riders that follow old mineral tramways and railways through the most picturesque Devonshire landscape. 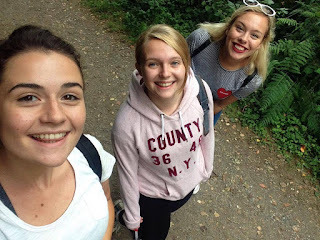 A group of adventurous bloggers met at Tamar Trails last week, we donned our best 'outdoorsy' attire (think: fashion bloggers in the wild) and were roaring with enthusiasm for the exciting day ahead. After delicious pots of tea and coffee all round at the Beech Tree Cafe (the most adorable cafe, decorated with bunting, fresh flowers and chalk boards) and a good old catch up (us bloggers can talk for England...), we met with Paul, creator of Tamar Trails, who talked us through the history and future of the centre. We then all marched through the woods where the sun shone through the leaves and children excitedly weaved in and out the trees. We arrived at a cleared space amongst the tall trees to find two large targets against a net. A group of men dressed in tutus and tiaras (a stag-do party, we were informed), finished shooting their last arrows as we stepped up to the firing range. The Tamar Trails instructors made a real effort to remember our names, get to know us, and were just generally really fun! She talked us through how to use a bow and arrow for the archery activity and of course ran the health and safety regulations for the potentially dangerous practice. We were then let loose with the bow and arrows to hit the targets. Surprisingly I wasn't too bad at all! 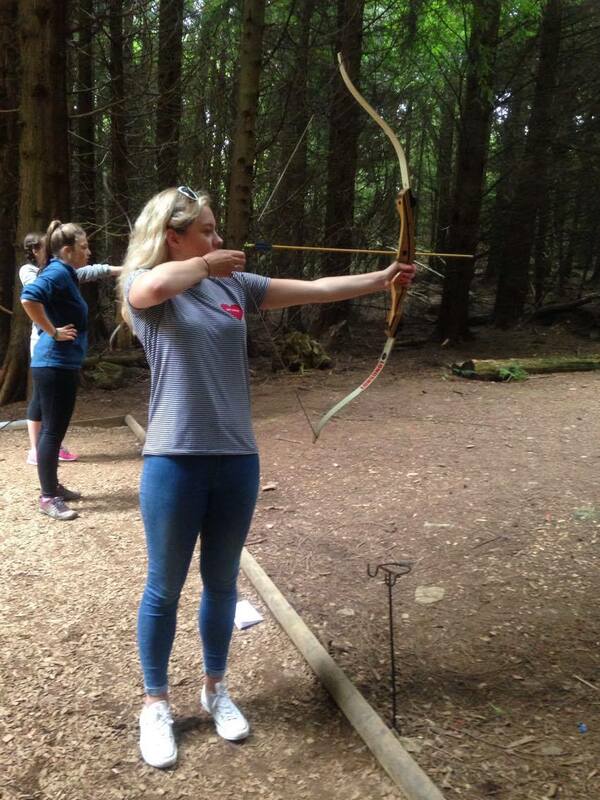 (After some initial issues: like holding the bow the wrong way round...) Our collective competitive streak led us to putting on a competition- whoever got the most points on the target wins! Despite me remaining in the lead for the majority of the game, Becca and Helen snuck up and beat me at the end, leaving me at a decent third place. 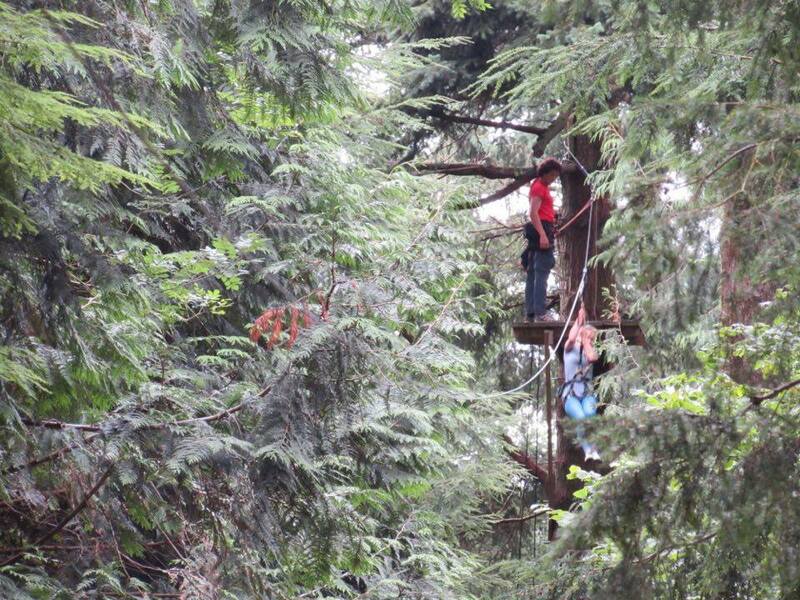 After our super fun archery session, we made our way to the Tree Surfing high ropes course. Sporting our fetching new harnesses, we nervously climbed up a very tall tree via a very small ladder until we were suspended 50 feet up in the woodland canopy. Following the safety rules, we were securely attached by our harnesses, meaning we didn't need to worry about potentially falling (thank god!) 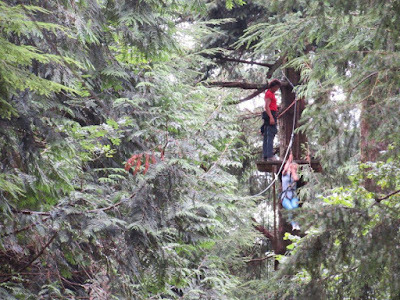 and set off on a crazy adventure in the tree tops! 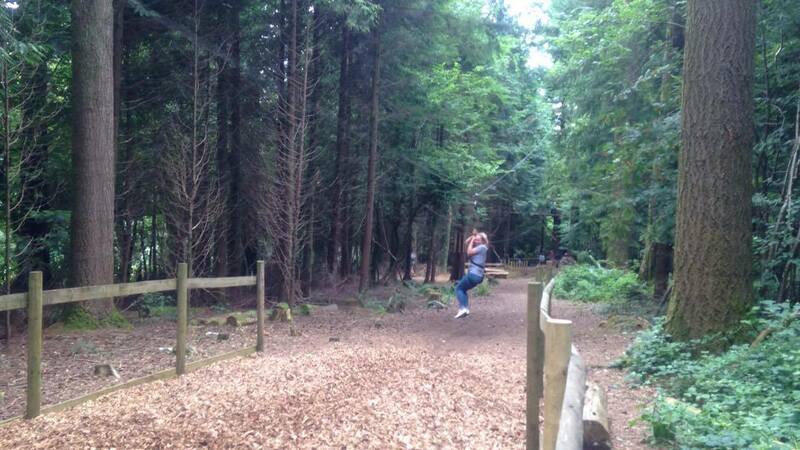 The course included tightropes, swings, bridges, ropes, zip- wires, ladders... the lot! It was definitely a challenge as it tested everyone's fears but it was great as we all worked really closely as a team to get through any nerve- wracking bits! Its a fantastic team- building and bonding exercise. And SO much fun! Adrenaline was pumping through my body for the whole hour and we all felt an amazing sense of accomplishment as we each jumped off the zip- wire at the finish point. Following the high ropes course, we made our way to the zip- wire. The views from the very top of the tallest tree were amazing and so were the views whilst zipping down through the trees, back to the forest floor. As you can see, I was a vision of grace and I came back down to Earth with a bump! After an afternoon of such excitement and adrenaline, we headed back to the Beech Tree Cafe for some much needed lunch! I absolutely loved this cafe. It is very quaint in its design, the staff seemed really nice and the selection of food and drink is fantastic! All of the produce is fresh and locally sourced which is something I'm very passionate about, so was great to see. I opted for a salmon sandwich and some elder-flower fizz, followed by a delicious chocolate brownie to share with my friends. A perfect end to a great day! 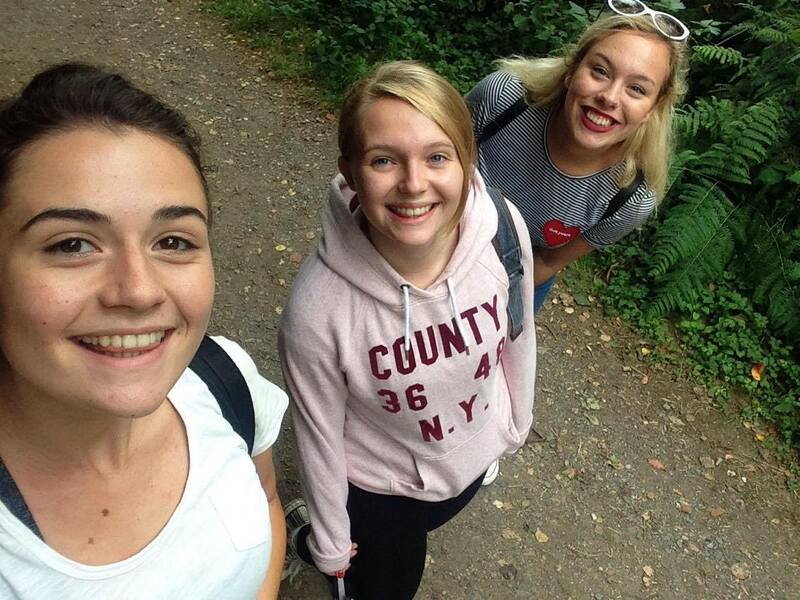 A big thank you to Tamar Trails, Beech Tree Cafe and Dart PR for holding a lovely day for us bloggers! We all enjoyed it thoroughly! I can't wait to come back and visit again some time! If you're in the South West area, make sure you check out Tamar Trails Centre as it is really an exceptionally fun day out for all! There is so much on offer for all of the family. Check out their website here. Disclaimer: I was invited to this event by Tamar Trails, Beech Tree Cafe and Dart PR but all thoughts and opinions are my own. Thanks to Becca Jane for helping with photos. Looked like a great day out, Ellie...and an ideal spot for hen or birthday parties!